What do you get when you let this region’s citizens explore a moving fusion of art, culture, community and science during on a two-hour train ride? Pure inspiration for building a better community! This afternoon, Machteld Faas Xander will be venturing to Lake Huron for our annual staff retreat in Kincardine, Ontario. This is a great opportunity for us to recharge our batteries, do some team building, have some fun, and learn more about each other. I’m sure we’re in for a rootin’ tootin’ good time … and hopefully some smores (I love those things). Our offices will close today at 4PM for an early weekend, and we will resume business as usual on Monday, June 20. Have a spectacular weekend. See you on Monday! The debate over Waterloo Region’s Light Rail Transit (LRT) is heating up. It’s all over the local media, it’s a go-to conversation in coffee shops, and as I walked to work this morning, the topic came up, as it typically has this past month, among my shoe-to-pavement commuters. LRT is definitely on everyone’s mind. As a creative design agency that works with many business, government and non-for-profit clients in this region, Machteld Faas Xander cares deeply about the community we live and work in. That’s why, as concerned citizens, we commissioned Angus Reid Public Opinion to conduct an online poll that would inform and let the people have their say. The poll was conducted online among 456 Kitchener, Waterloo and Cambridge adults, between May 23 to May 25, 2011. The results showed a majority (73 percent) in agreement that this community desperately needs an updated public transit system to address population growth. Fifty-eight percent said a transit option that includes LRT would benefit Waterloo Region. “We wanted to more fully understand the familiarity and attitudes towards the proposal to build a rapid transit system between Kitchener, Waterloo and Cambridge,” says Alison De Muy of Machteld Faas Xander and its decision to commission the poll by Angus Reid Public Opinion. •	Seventy-two percent of residents indicating that the impact of LRT would be positive for the Region. •	Half of residents claiming that the LRT would help ease traffic congestion. •	Half of residents indicating that ridership would increase if LRT were an option. And although poll respondents believe that the cost of LRT is significant, 53 percent still indicate that the cost to taxpayers would be acceptable in exchange for the development of the rapid transit infrastructure and the benefits it would bring to this community—including unification of the region, job creation, further economic development, and protecting valuable farmland from urban sprawl. Stay tuned for more on LRT as Regional Councilors are expected to vote on June 15, 2011. In the meantime, you can read about LRT updates and check out the poll results at RQ Magazine. posted by admin on June 3rd, 2011 | Was the Machteld Faas Xander Rebrand Successful? In March, MFX Partners formally underwent a brand identity change, becoming Machteld Faas Xander. The response from many of you was intrigue, delight and astonishment. While others stared at us bewildered and asked, “How the heck do you pronounce that?”, which we promptly handled with a handy pronunciation key. You might think that because we’re a creativity firm that’s helped rebrand numerous companies and their products, rebranding ourselves would have been easy. And even though we have a creative process for this type of thing, it took a lot of brainstorming, head scratching and late nights to find a brand identity that meant more than just a name on our office door. But the larger question remains, were we successful? 1. Firstly, we wanted to maintain the equity we had in the name MFX for the past 10 years. From a customer relations, marketing, SEO point of view, etc, this is priceless. 2. Secondly, we also wanted names you wouldn’t normally hear on the street and associate with feelings and emotions, as with common names like “Mike” or “Jen”. Because we’re different; we deserved different (this is where we got really creative) we used very distinct names that allow us to assign whatever values and stories we want. 3. Lastly, our new identity had to embody the “passionate creative people” that are part of our world; the values of our owners and founders, John and Rebecca Short; and, by god, it had to make a lasting impression. And yes, we still have people looking at us in slight disbelief when we tell them where we work, but there is no finer way to spark up a conversation. In the end, we can stand confidently beside Machteld Faas and Xander as archetypes that embody our values as a company. And as we grow, archetypes are the best way to communicate these values clearly to staff and customers. MFX exemplifies Machteld, the Creator archetype who encourages creative expression from everyone, throughout the organization; Faas, our Explorer archetype, infuses his fierce independence and drive for learning and working into our culture; and finally, from Xander, the Magician archetype, we’re ever-reminded that the best way to inspire people is by showing them. In the end, we’ve come full circle. We used our own process to develop a brand that not only helps us think better, but also shows us that when we come together in a fun, positive, open environment—we can accomplish anything—and that is the type of success we can be proud of. Comments Off on Was the Machteld Faas Xander Rebrand Successful? Category: Communication Design | Comments Off on Was the Machteld Faas Xander Rebrand Successful? At The Design Changes Project we love our partnership with the Accelerator Centre and the The Communitech Hub (The Design Changes Project, Accelerator Centre, The Communitech Hub). We have the opportunity to work with brilliant entrepreneurs to help make their innovative ideas look great and speak to their customers. 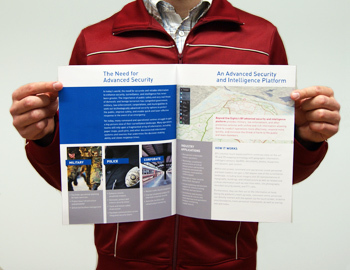 When Beyond One Eighty, a Communitech Hub client, came to us they were looking for a brochure design for distribution at a major trade show. 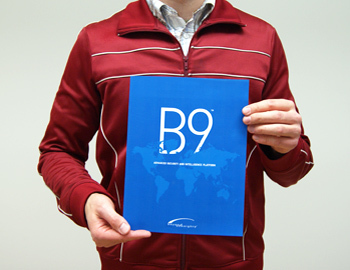 The brochure featured their product, the B9, which uses a touch-based platform that combines state-of-the-art 3D and 2D mapping technology with geographic information. We worked together with Taylor Nicholls, the principal of Beyond One Eighty, to distill information about the B9 and design a layout that told its story. Thank you to Taylor for being a great client and best of luck to Beyond One Eighty! Who knew that a casual lunch with an old friend could lead to some of the most rewarding work of my career and an exciting new consulting gig for the Business Design team at Machteld Faas Xander (MFX)? This is a story about a big, somewhat traditional organization who were struggling to make innovation a part of every employee’s job. Another well meaning, but ineffective idea generation contest was definitely not the answer. Luckily for us, we quickly discovered that the company had the right leadership team and work climate in place to make the necessary shifts required. To come to this realization, we used our Creative Climate Assessment, which employees filled out online in just a few minutes. Clients like how fast the survey takes to complete, and how fast they can get the results and identify quick changes to energize their team. The assessment identified the aspects of the organization that are supporting creativity and innovation today, those that are hindering it and the top priorities to better enable creativity and innovation. We’ve also been working with a cross-disciplinary project team made up of 14 adventurous employees from the company. The intent of the work is to develop innovative products or solutions to address unmet customer needs. This project kicked off with a full-day Design Thinking workshop led by MFX. Unlike most training programs with content that is quickly forgotten we ensure the principles and practices we share become part of life within organizations by working on a real business challenge over a period of 6-12 months. As part of this project, research was required to identify unmet customer needs. MFX traveled across Canada to conduct research with the company’s top customers. We utilized a unique mapping process, which revealed 35 opportunities to improve the lives and businesses of our client’s customers. The next step of this project will involve prioritizing the list of opportunities, brainstorming, prototyping and testing possible solutions. 1. Understand the working climate to build on the good stuff and minimize the barriers. 2. Establish a project team who learn and apply key principles and techniques on a real business challenge. 3. Utilize advanced design research techniques to unpack what customers are trying to achieve to identify ways to help them do them better, faster, cheaper etc.